The imaging spectrum of pulmonary metastases varies greatly, with solid and partly cavitating nodules being the most common. When imaging the oncology patient, specifically follow-up imaging post-treatment, the radiological aim is to assess for disease regression and thus treatment response, usually with resolution of these nodules. We report an interesting case series of a patient with primary endometrial carcinoma presenting with pulmonary metastases. This imaging series eloquently depicts the temporal evolution of the metastatic solid pulmonary nodules to cavitating nodules and finally to thin-walled cysts. Baseline imaging in this scenario is vital to exclude pre-existing cystic lung disease. The progression of solid pulmonary metastases to simple cysts is an uncommon therapy-related consequence, but an important entity to recognise, not only as an indicator of good treatment response, but also to evaluate for potential life-threatening complications such as spontaneous pneumothoraces. The radiological imaging spectrum of pulmonary metastases is vast and may range from solid nodules to lesions mimicking pulmonary cysts. The histology of the primary tumour is often helpful, particularly in the setting of squamous cell carcinomas, where primary and secondary pulmonary lesions often appear to be cavitating. We report an interesting case series of patient KM, a 64-year-old female who had presented with a 4-month history of post-menopausal vaginal bleeding. Her co-morbidities included senescent hypertension and cardiac disease, stable on double agent anti-hypertensives. She was also a social smoker. An initial pipelle biopsy sent for microscopy revealed moderately differentiated carcinoma in the endometrial tissue which stained positive for vimentin and oestrogen receptors, but negative for carcinoembryonic antigen (CEA). This was consistent with endometrial adenocarcinoma. She subsequently presented to radiology for staging computed tomography (CT) scan post-surgery (bilateral salpingo-oophorectomy and total abdominal hysterectomy). Her post-operative recovery was volatile with ureteric reimplantation required after iatrogenic injury, several urinary tract infections and renal complications. Patient KM's initial CT abdomen/pelvis, with imaging through the lung bases, revealed multiple bilateral solid pulmonary nodules of moderate size, in keeping with Stage 4 disease. The distribution was random with no associated calcifications, septal thickening or pleural effusions. She received single agent palliative chemotherapy with Paclitaxel 280 mg, a taxane-based chemotherapy agent targeted for the treatment of endometrial adenocarcinomas. The usually used combination treatment of a cisplatin was not utilised owing to her ongoing renal dysfunction. On dedicated chest imaging, approximately a month after initial staging and initiation of treatment, several of the previously noted solid pulmonary nodules now demonstrated discrete central lucencies, in keeping with cavitation. Figure 1 eloquently demonstrates this central cavitation. Upon completion of the six cycles of chemotherapy, the final staging scan performed approximately 3 months later exhibited good treatment response with disease regression. All the afore-documented solid and early cavitating pulmonary nodules had now resolved to thin-walled cysts with no associated soft tissue component, calcification or ground glass attenuation. No pneumothorax was present. 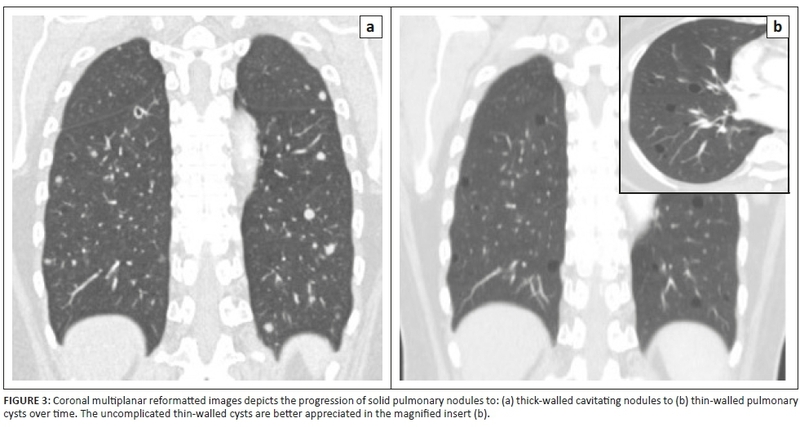 Figure 2 depicts the temporal evolution of several focal right lower lobe solid pulmonary nodules to thin-walled cysts on axial CT images. In Figure 3, we can also clearly appreciate this cavitating trend on coronal multiplanar reformatted images. The evolution of solid pulmonary metastases to cavitating and then cystic lesions, as a consequence of therapy, is a fairly rare entity albeit an important one to consider. 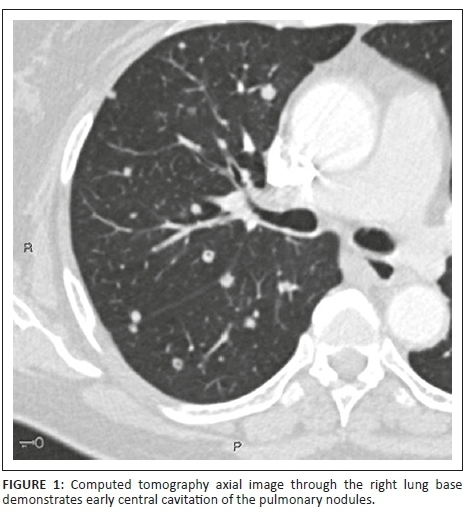 The possibility of spontaneous pneumothorax is an uncommon but significant complication, which requires interval clinical and imaging evaluation to preclude preventable patient morbidity and mortality.